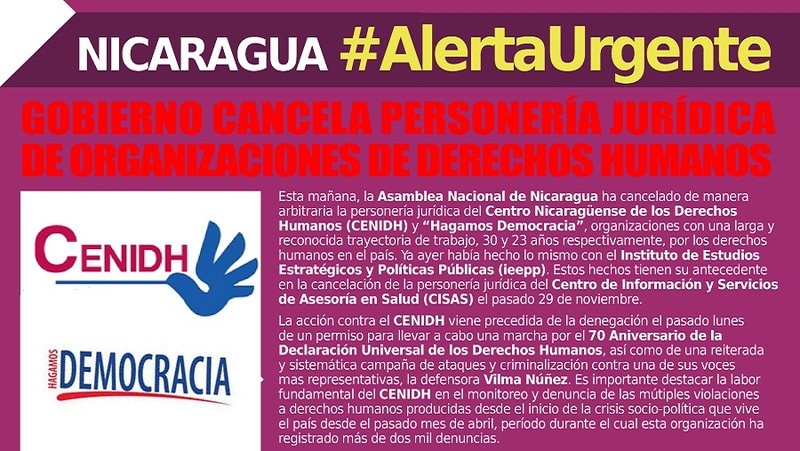 This morning the National Assembly of Nicaragua arbitrarily cancelled the legal status of the Nicaraguan Center for Human Rights (CENIDH) and Hagamos Democracia (Let’s Make Democracy), two organizations with a long, widely recognized history, 30 and 23 years respectively, of working for human rights in the country. Yesterday it did the same thing with the Strategic Studies and Public Policies Institute (IEEPP). The precedent for these actions was the cancellation of the legal status of the Center for Health Information and Consulting Services (CISAS) last November 29th. The move against the CENIDH was preceded by last Monday’s denial of a permit to hold a march on the 70th Anniversary of the Universal Declaration of Human Rights, along with a recurrent, systematic campaign of attacks and criminalization of one of its most representative voices, the woman defender Vilma Núñez. It is important to underscore the crucial role of the CENIDH in monitoring and denouncing the numerous human rights violations that have occurred since the beginning of the socio-political crisis that the country has gone through since last April, a period in which the organization has registered more than two thousand complaints. 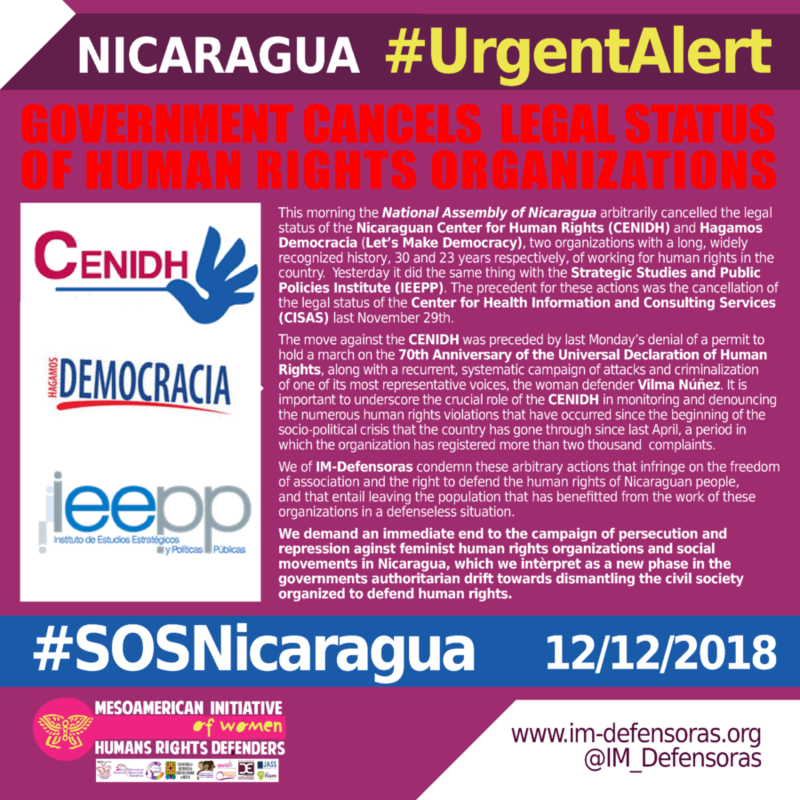 We of IM-Defensoras condemn these arbitrary actions that infringe on the freedom of association and the right to defend the human rights of Nicaraguan people, and that entail leaving the population that has benefitted from the work of these organizations in a defenseless situation. We demand an immediate end to the campaign of persecution and repression aginst feminist human rights organizations and social movements in Nicaragua, which we intèrpret as a new phase in the governments authoritarian drift towards dismantling the civil society organized to defend human rights.